We encourage adolescents to consider higher education and help them with extra lessons to prepare for the entry examinations. 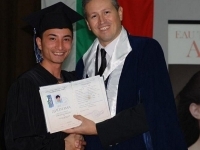 We provide scholarships and guidance to the young people who become university students. Extra lessons in reading writing and numeracy. English lessons to the children from Doganovo orphanage. “No aggression by sports and dances” The children participate in the following sports: football, volleyball, athletics, badminton, table-tennis and have won many championships and awards. Their physical condition has improved; the children feel more confident and appreciated. Their sports and dances success has helped their social inclusion and self confidence. We have renovated and set up computer halls and have launched computer literacy in Vratsa, Razliv, Doganovo, Roman, Stara Zagora. Among the lessons that mostly appreciated are the cooking lessons. The children learn to cook for life and most of them receive diplomas which enables them to get a job. The kids in the institutions love the cooking because after the lessons they enjoy the food that has been prepared.